You guessed right, Daryl—the mosaic in the banner photo above lives just off the shore of Ipanema beach in Rio de Janeiro, Brazil. 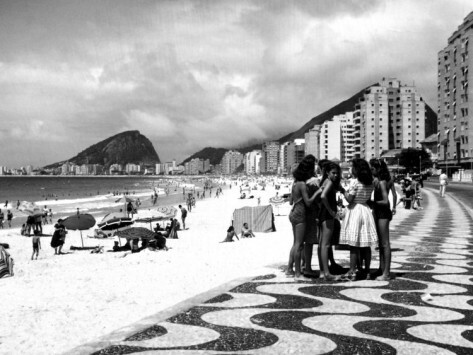 Congratulations on being the first to respond correctly—your iTunes gift card is on the way (you should consider downloading Getz & Gilberto’s Girl from Ipanema to commemorate your win!). Robert and I visited my family in Rio a year and a half ago to do some book research and to partake in Copacabana’s epic New Year’s Eve celebration (more on that festive trip in a later post). We spent our first free afternoon walking the mosaic sidewalks hugging the shores of Ipanema, Copacabana, and Leme beaches. Following in the footsteps of my grandfather and his siblings, who arrived in Rio in ’41 and ’46, respectively, was quite surreal. What a shocking change of scenery it must have been for them, stepping off the boat from war-torn Europe to a strip of white sand and sparkling sea! I did a little digging and I learned that Rio’s ubiquitous sidewalk mosaics are the work of landscaping artist Roberto Burle Marx. The pattern is meant to capture the movement of the sea. For me, the mosaic is symbolic of my research—of my mission to piece together the stories of my family’s fragmented past. I also see it as a symbol of unity—a coming together of sorts. My grandfather and his siblings spent the majority of the Second World War scattered across five continents, determined to survive, and to reunite. It was in Rio, after a seven-year survival saga, that their paths finally converged.